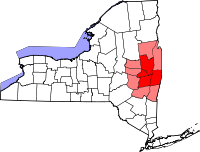 Ballston Spa is a village and the county seat of Saratoga County, New York, United States, located southwest of Saratoga Springs. The population of the village, named after Rev. Eliphalet Ball, a Congregationalist clergyman and an early settler, was 5,556 at the 2000 census. Ballston Spa lies on the border of two towns, situated partly in the Town of Ballston and partly in the Town of Milton. The village was first settled in 1771. In 1787 Benajah Douglas, grandfather of 1860 presidential candidate Stephen A. Douglas, built the first tavern and hotel at Ballston Spa. It was located near the natural spring. In 1803 Ballston Spa's Sans Souci Hotel, at the time the largest hotel in the United States, was built by Nicholas Low. Presidents, senators and governors stayed there, as well as many wealthy private citizens. Ballston Spa was incorporated as a village in 1807. At one time the village was served by four railroads: the Delaware and Hudson Railway, the Ballston Terminal Railroad, the Schenectady Railway Company, and the Hudson Valley Railway. The village was famous for its mineral water spring used for healing in sanatoriums, including the Hawthorne and Lithia springs. The effervescent water, tonic, and cathartic from this city is also known as Ballston Spa. The liquid contains common salt and carbonates of magnesium and calcium. Portions of the novel The Last of the Mohicans were written by James Fenimore Cooper in the present day Brookside Museum and inspired by the local landscape. The village was the model for the village of North Bath, NY, the setting for the 1993 best-selling novel and 1994 movie, Nobody's Fool. The book's author, Richard Russo, is a native of nearby Gloversville. It was also the location of the fictional "Elspeth Hatch" murder trial defended by Clarence Darrow set in 1897 in the book titled The Angel of Darkness by author Caleb Carr. Several scenes in Sydney Pollack's 1973 film The Way We Were were filmed on Ballston Spa's Front Street. Scenes from The Horse Whisperer (1998) were also filmed in the village. Since 2008 Ballston Spa has been home to the Ballston Spa Film Festival of short films from around the globe. Ballston Spa is home to the National Bottle Museum. 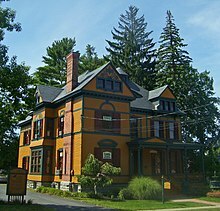 It is also home to Brookside Museum, Saratoga County Historical Society. The Brookside Museum, United States Post Office, Union Mill Complex, and Verbeck House are listed on the National Register of Historic Places. George West (known as the "Paper Bag King") developed a line of square-bottomed paper bags which he manufactured by the millions after the American Civil War, and at one time owned almost a dozen paper mills located along the Kayaderosseras Creek. The village was also home to the Ballston Knitting Company from 1918 to 1994. Stephen Steele Barlow, Attorney General of Wisconsin. Abner Doubleday, American Civil War hero and supposed inventor of baseball was born in Ballston Spa. The house he was born in is designated as a New York State landmark. General James Gordon, a veteran of the American Revolution, lived in Ballston Spa. Gordon Creek is named after him. Trevor Marsicano, Olympic short-course speedskater, winning a silver medal in the Team Pursuit at the 2010 Games. Frances Shimer (1826–1901), founder and first president of Shimer College. Ebby Thacher, Bill Wilson's (co-founder of Alcoholics Anonymous) sponsor. Stephen Trombley, Emmy Award-winning film maker, author and musician, is a 1972 graduate of Ballston Spa High School. Todd Waring, television and movie actor, 1973 graduate of Ballston Spa High School. Hon. George West acquired ten paper mills situated along the Kayaderosseras Creek from 1862 to 1899 and became the largest manila paper manufacturer in the world. Also was a member of the NYS Assembly and US Congress. Ballston Spa is located at 43°0′26″N 73°51′4″W﻿ / ﻿43.00722°N 73.85111°W﻿ / 43.00722; -73.85111 (43.007185, -73.851168). 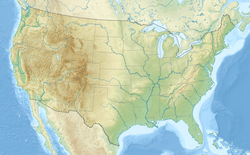 According to the United States Census Bureau, the village has a total area of 1.6 square miles (4.1 km2), of which, 1.6 square miles (4.1 km2) of it is land and 0.62% is water. New York State Route 50 (Milton Avenue), a north-south highway, passes through the village and intersects New York State Route 67 (West High Street). County Road 63 (Malta Avenue) leaves the village to the east, connecting it to U.S. Route 9 and Interstate 87 (The Northway). As of the census of 2000, there were 5,556 people, 2,267 households, and 1,385 families residing in the village. The population density was 3,464.8 people per square mile (1,340.7/km²). There were 2,398 housing units at an average density of 1,495.4 per square mile (578.7/km²). The racial makeup of the village was 96.33% White, 1.17% African American, 0.16% Native American, 0.52% Asian, 0.61% from other races, and 1.21% from two or more races. Hispanic or Latino of any race were 1.94% of the population. There were 2,267 households out of which 32.4% had children under the age of 18 living with them, 45.9% were married couples living together, 10.8% had a female householder with no husband present, and 38.9% were non-families. 32.1% of all households were made up of individuals and 11.6% had someone living alone who was 65 years of age or older. The average household size was 2.32 and the average family size was 2.94. In the village, the population was spread out with 23.9% under the age of 18, 8.1% from 18 to 24, 32.7% from 25 to 44, 18.7% from 45 to 64, and 16.6% who were 65 years of age or older. The median age was 36 years. For every 100 females, there were 88.2 males. For every 100 females age 18 and over, there were 85.2 males. The median income for a household in the village was $37,173, and the median income for a family was $49,387. Males had a median income of $36,929 versus $27,281 for females. The per capita income for the village was $20,237. About 7.4% of families and 10.6% of the population were below the poverty line, including 16.8% of those under age 18 and 5.1% of those age 65 or over. St. Mary's is a Catholic school located in Ballston Spa, providing students with a Catholic education from preschool through 5th grade. Spa Christian School is a small, private, non-denominational Christian school for children Pre-K to 6th grade. The Church Mouse is a Christian preschool and pre-K. This climatic region is typified by large seasonal temperature differences, with warm to hot (and often humid) summers and cold (sometimes severely cold) winters. According to the Köppen Climate Classification system, Ballston Spa has a humid continental climate, abbreviated "Dfb" on climate maps. ^ "History of Ballston, NY". The Saratogian. 1899. Retrieved 9 November 2010. ^ "History of Milton, NY". History.rays-place.com. Retrieved 2012-11-25. ^ "History of Saratoga County, History of the Village of Ballston Spa". Rootsweb.ancestry.com. Retrieved 2012-11-25. ^ DiCarlo, Gino. "Saratoga Line". Gino's Rail Pages. Retrieved Nov 19, 2014. ^ "Spa, Sanatorium". The Independent. Jul 13, 1914. Retrieved August 21, 2012. ^ "Ballston Spa Film Festival". Retrieved August 29, 2013. ^ "Ballston Spa National Bank Now Open in Latham at 1207 Troy Schenectady". 19 August 2015. Retrieved 10 March 2017. Wikivoyage has a travel guide for Ballston Spa. 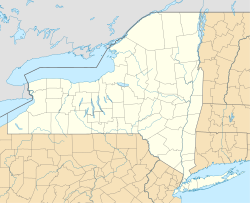 Wikimedia Commons has media related to Ballston Spa, New York. Wikisource has the text of the 1911 Encyclopædia Britannica article Ballston Spa.